Easy…fun for kids…fun for grown-ups…great for gifts, parties and holidays! The question should be–why not? Toss together a few ingredients. Add a bit of this and a bit of that… and presto! You have an instant snack sensation. Raisins or Yogurt covered raisins, sunflower seeds, etc. Your choice of M&M’s, chocolate chips, mini marshmallows, small chewy candies, etc. Put the variety of ingredients out in bowls. 2. After children wash their hands–give them each a baggie. (To keep track of whose is whose – have them write their name on it) The ingredients will then go into each child’s baggie with their choice of mixes. TIP: Let children know how much ‘measurement-wise’ they can take of offered foods; also how many choices they can have. Example: Each child can take 1/2 cup of 4 food choices offered. 2. Mix in pretzel sticks, fish crackers, small snack crackers, raisins, oyster crackers, M&M’s, etc. Almost anything that is left-over in the pantry. 3. Mix well, and place in individual sandwich baggies or paper cups. This is a great “take-along field trip snack” or “take it outdoors snack”… It will also help you clean out those “little leftovers” in your food storage. Mix all together and store in airtight container. Combine Goobers, pretzels, marshmallows, raisins, apricots and apples in large bowl. Heat oven to 250°F (120°C). In ungreased large roasting pan, melt butter in oven. Stir in seasonings. Gradually stir in remaining ingredients until evenly coated. Microwave Directions: In large microwavable bowl, microwave butter uncovered on High about 40 seconds or until melted. Stir in seasonings. Gradually stir in remaining ingredients until evenly coated. Microwave uncovered on High 5 to 6 minutes, thoroughly stirring every 2 minutes. Spread on paper towels to cool. Store in airtight container. TIP: The original recipe includes Corn Chex, Rice Chex and Wheat Chex. You can mix and match to suit your taste–just use a total of 9 cups of cereal. Combine cereals, nuts and pretzels in slow cooker. Mix melted butter with remaining ingredients and seasonings; pour over the cereal mixture, tossing to coat. Cook, uncovered on HIGH for 2 hours, stirring about every 30 minutes. Turn to low and cook another 2 to 6 hours. Store in an airtight container. Makes about 10 cups. Preheat an oven to 225 degrees F (110 degrees C). Combine the wheat cereal, corn cereal, rice cereal, oat cereal, cheese-flavored crackers, pretzels, and mixed nuts in a large bowl; set aside. 2. Melt the butter in a saucepan over medium heat. Whisk in the garlic powder and Worcestershire sauce until evenly blended. Pour over the cereal mixture, and gently stir until the cereal is evenly coated with the seasoned butter. Spread the cereal mixture onto baking sheets. 3. Bake in the preheated oven for 1 hour, stirring every 15 minutes. Allow to cool to room temperature before storing in an airtight container. Melt butter and Worcestershire sauce in a roasting pan. Bake for 2 hours, stirring well every 20 minutes. Combine first 4 ingredients in a large roasting pan; stir well. Combine last 3 ingredients; stir well. Drizzle over nut mixture; stir well. 1. Heat oven to 350 degrees F. Line rimmed baking sheet with foil. 2. Combine butter, peanut butter, vanilla and cinnamon in a microwave-safe bowl. Microwave on HIGH 35 to 45 seconds, stirring until well blended. 3. 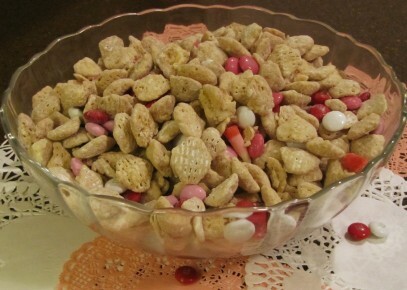 Combine cereal, mixed nuts and pretzels in large bowl. Pour butter mixture over cereal mixture. Toss well to coat. Spread mixture evenly on foiled baking sheet. 4. Bake 10 to 12 minutes, stirring occasionally. Cool. Sprinkle lightly with cayenne pepper, if desired. Toss. Store in resealable food storage bag. 1. Place butter in 4-quart microwave-safe bowl. 2. Microwave at HIGH (100%) 1 minute or until melted; stir in sugar, cocoa and cinnamon. Add cereals and cashews; stir until evenly coated. 3. Microwave at HIGH 3 minutes, stirring each minute; stir in dried fruit. 4. Microwave at HIGH 3 minutes, stirring each minute. 5. Cool completely; stir in chocolate chips. Store in tightly covered container in cool, dry place. Line 3 baking sheets with waxed paper or parchment. Set aside. Place the first five ingredients in a large bowl. Microwave the chips/almond bark and the vegetable oil until melted. Stir the mixture until creamy and smooth. Pour over the dry ingredients and mix well. Spread on wax paper covered counter. Cool and break apart. Snack mix with chocolate, peanuts, marshmallows and pretzels. Start to Finish:50 min. Place chocolate chips in freezer to chill. In large bowl, mix cereals, peanuts, pretzels and marshmallows; set aside. In large microwavable bowl, microwave candy coating uncovered on High 1 minute 30 seconds; stir, breaking up large chunks. Microwave about 30 seconds longer or until coating can be stirred smooth. Gently and quickly fold cereal mixture into coating with rubber spatula, stirring gently until evenly coated. Stir in chilled chocolate chips. Spread on waxed paper; cool completely, about 30 minutes. Break into chunks. Store in airtight container in refrigerator. Mix cereal, peanuts and raisins in bowl. Melt butter in saucepan over low heat or microwave. Pour melted butter over cereal mixture and toss lightly until coated thoroughly. Sprinkle chocolate chips over the mixture and toss again. This snack mix relies on lightly sweetened popcorn to give it just the right flavor. Some prefer “Mallow Magic” popcorn from Jolly time. The “Caramel” flavor variety from Act II is also yummy-Or just use your favorite kettle corn. For a good sized group take 3 bags of popcorn, plus 1 bag of goldfish, 2 cups of pretzels, plus 1/2 cup each of raisins and dried cranberries. However you can make it — in whatever proportion you like. Note: the “Mallow Magic” comes with packets of icing to put over the top; it’s not necessary. Combine margarine, brown sugar, corn syrup and salt in a large microwave-safe bowl. Microwave on High for 2 to 3 minutes or until mixture comes to a boil. Microwave for several minutes longer, stiring several times, so mixture will have boiled for 2 to 3 minutes. Add the cereal and peanuts; mix well. Spread on a greased baking sheet to cool, stirring several times. In 1-quart microwavable bowl, microwave chocolate chips, peanut butter and butter uncovered on High 1 minute; stir. Microwave about 30 seconds longer or until mixture can be stirred smooth. Pour mixture over cereal, stirring until evenly coated. Pour into 2-gallon resealable food-storage plastic bag or large paper bag. 3. In a paper bag or very, very large bowl) put 2 1/2 cups confectioner sugar. 4. Add coated cereal. Shake/fold well and pour onto wax paper. You will find that the cereal ablsorbs the mixture and even tastes better the next day! Place cereal in very large bowl. 2. In small microwavable bowl, melt vanilla chips, peanut butter and butter uncovered on High 1 minute (or until melted and smooth)It’s important to keep watching as not to overcook mixture. Pour peanut butter/white chocolate/butter mixture over cereal, folding gently until evenly coated. Preheat oven to 300°F (150°C). Line a 15 1/2 X 10 1/2 X 1-inch jelly roll pan with foil. Set aside. Blend oil and honey in a large bowl. Add oats, wheat germ, and almonds and mix well to coat. Spread mixture evenly in pan and bake uncovered, stirring occasionally, until golden brown, about 25 minutes. Remove from oven, stir in raisins, and cool to room temperature. 5. 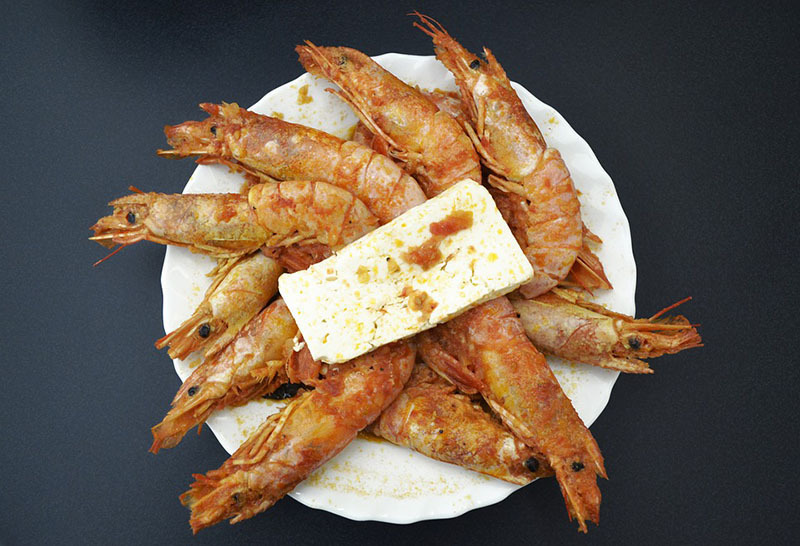 Store in an airtight container at room temperature for up to 2 weeks. Note: Add or substitute almost anything in the dried fruit, nut, and/or seed department such as coarsely chopped dried apples, apricots, or pears, toasted pumpkin or sunflower seeds, toasted chopped pecans or cashews. This delicious snack can be addictive! Combine popcorn, cereal and pretzels in a large bowl. Combine butter and taco seasoning and drizzle this over popcorn mixture. The only trick to this recipe is finding a big enough container in which to mix the treats. Most of these ingredients are available in a variety of weights and sizes. Don’t worry if you can’t find the exact amount given. In a very large container, mix all of the ingredients together, tossing gently. Store in airtight containers, gift tins, or zip-top bags at room temperature for up to 3 weeks. Makes 26 cups (6 1/2 quarts). Mix all dry ingredients in large bowl and melt white chocolate chips in microwave and cover and mix, then lay on wax paper until cooled. Break into pieces. In a large bowl, combine the pretzels, nuts and sunflower kernels. Combine the butter, cinnamon and cloves. Drizzle a third of butter mixture over pretzel mixture; toss to coat. Transfer to a greased 15-in. x 10-in. x 1-in. baking pan. Bake at 300° for 15 minutes. Place popcorn in a large bowl; drizzle with remaining butter mixture and toss to coat. Stir into pretzel mixture. Bake 15 minutes longer or until heated through. Cool; transfer to a large bowl. Add candy corn and bridge mix; toss to combine. #3… An easy way to provide AUTUMN/THANKSGIVING PARTY FOOD for kids (or adults) is to create a huge bowl full of snack mix. Start with a box or two of your favorite snack cereal Add candy corn, raisins, small marshmallows, small pretzels, chocolate chips and other treats to the mix. Measure and combine all of the ingredients in the order listed above. Mix well with mixing spoon. This is a good one for your newsletter…really cute! #7… THANKSGIVING SNACK MIX ‘WITH A MESSAGE’ … This is great to serve as a snack… or to tie up prettily in a baggie with raffia and a note explaining the symbolism of the ingredients! 1. Line cookie sheet with foil or waxed paper. Place cereal in large bowl. 3. Pour over cereal; toss to evenly coat. Spread mixture in single layer on cookie sheet. Immediately sprinkle with remaining candy. Let stand until set, about 20 minutes. Gently break up coated cereal. Store in airtight container. Put Hershey’s chips into a microwave-safe bowl and microwave for 1 to 2 minutes, or until smooth. While the chips are melting, gently put the Rice Chex into a separate bowl. Gently pour the melted chocolate over the Rice Chex. Gently stir the chocolate and Rice Chex together until all the Rice Chex are covered. Put 1/4 of the mixture into a zip lock bag with 1/2 cup powdered sugar and shake gently until Rice Chex are covered with sugar. Pour into a storing dish. Cover the remainder of the Rice Chex with powdered sugar in the same manner. In a large bowl, combine the first six ingredients. In another bowl,combine the butter, syrup, Worcestershire sauce, Cajun seasoning and cayenne; pour over cereal mixture and toss to coat. Transfer to an ungreased 15-in. x 10-in. x 1-in. baking pan. Bake, uncovered, at 250 degrees F for 1 hour, stirring every 15 minutes. VALENTINE LOVE CHOW — Nice for V-Day–but switch the colors of candy and make it any time of the year! In small microwavable bowl, melt vanilla chips, peanut butter and butter uncovered on High 1 minute (or until melted and smooth)It’s important to keep watching as not to overcook mixture. Add M&M candy–and ‘optional’ red/white/pink candy corn. If bowl is large enough, add powdered sugar and gently fold it into the cereal mixture. If bowl is not large enough, place cereal in a paper bag with the powdered sugar and gently shake until cereal is covered. Add optional sprinkles at this time. Place mixture on waxed paper or foil; cool and set about 15 minutes. Store in airtight container. NOTE: When first made– the mixture tasted very sweet. It was actually better the second day. (I find the cereal absorbs the mixture as it sits.) Both children and adults said ‘yumm’ to this goodie! We’ll be making it again next year! Either pre-make mix or put the variety of ingredients out in bowls. For some added fun–make small signs withthe name of the “Ocean Themed” ingredientand place in from of each food choice. Draw or cut out pictures for children who can’t read! After children wash their hands–give them each a baggie. (To keep track of whose is whose – have them write their name on it) The ingredients will then go into each child’s baggie with their choice of mixes. Put small amounts of trail mix, cereal, pretzels, etc. in plastic sandwich bags and insert them in cardboard toilet paper tubes. Then wrap tube in a piece of tissue paper and tie the ends with yarn or ribbon. Apple Recipes-Check out APPLES ON A STICK near the page middle. All kinds of DIPPED PRETZELS and Pretzel Treats.